The new Tempest instrument washer is an ultrasonic, enzymatic soak, agitation, exterior fluid spray and interior lumen flush system — unlike anything else you have ever seen. Surgical instrument cleaning has just reached a new level of excellence. The Midbrook Tempest is redefining the meaning of "clean" when it comes to surgical instruments and all-critical laparoscopic devices. "You Cannot Afford To Ignore the Rate of Hospital-Acquired Infections (HAI's) In Your Hospital — Certainly Not in 2012"
Hospital-acquired infections (HAI's) are on the rise, and they are already a terrible source of problems for surgical facilities throughout the United States. One recent study showed that an average hospital is seeing 4.5 infections for every 100 admissions, and is losing on average $1.9M per year as a result. — Hospitals in the United States are averaging 4.5 infections for every 100 admissions. — In consequence, an average hospital is losing $1,900,000 per year as a direct result of nosocomial infections (HAI's). Now, all of these infections aren't the result of improperly cleaned or improperly sterilized surgical instruments. Obviously. But surgical site infections are accounting for approximately 30 percent of the HAI's (second only to blood stream infections, which are accounting for 32 percent). — A surgical site infection (SSI) costs the hospital responsible for the infection, on average, $10,000. — And it's about to get worse. Come 2012, Medicaid's federal match will no longer be paying for many HAI's, and Medicaid will be penalizing hospitals with high rates of preventable HAI's. Preventable is the key word in that last sentence. Because the majority of surgical site infections (or all nosocomial infections for that matter) are preventable. With proper instrument cleaning and sterilization procedures, your rate of surgical site infections would be radically reduced. With a few other simple measures and protocols in place, you would be saving your facility quite literally millions of dollars. 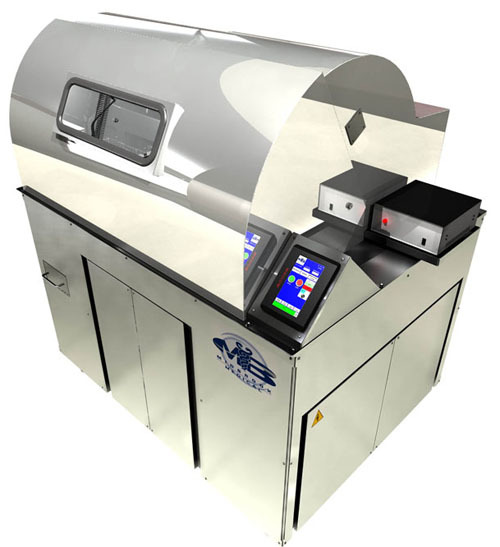 The new Midbrook Tempest is changing everything when it comes to state-of-the-art surgical instrument cleaning and laparoscope cleaning. Most hospitals are relying on instrument washers that cannot truly clean all of the bio-burden from the inside of laparoscopic instruments, and in general allow their surgical instruments to be handled far too much during the cleaning process, and permit an unacceptable level of potential human error and discrepancy in the way their surgical tools, laparoscopic instruments, DaVinci tools, and lumens are cleaned prior to sterilization. With the new Tempest Instrument Washer, all of the room for error has been eliminated. All that remains is a perfect cleaning cycle designed to deliver the most effective results yet obtained in completely removing bio-burden from your instruments. Every single time. Your system currently requires that a staff member physically move instrument trays between stages of your cleaning process (subjecting them to exposure), and requires that enzymatic cleaner be measured and added manually (allowing for variations in protocol). 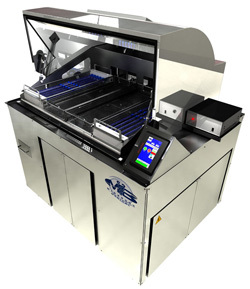 Your instrument cleaning is anything but automated, and it is not consistantly reproducable. The Tempest is fully programmable and entirely automated, delivering the most comprehensive cleaning cycle available in the industry today. The Tempest couldn't be simpler to operate, and because of this, it removes all of the complications so often leading to points of failure and human error with other devices. Your system is only flushing the cannulas and laparoscopic instruments with water, almost invariably leaving a residue of bio-burden behind. What's more, your current system is probably only using water and enzymatic cleaner, not a mixture of water and air, alternating with enzymatic cleaner, to fully scrub your instruments from the inside out. The Tempest delivers multiple flush cycles, combining precisely calculated enzymatic-dosed water and air-injection bubble cavitation steam to fully and truly "scrub" the insides of your laparoscopic surgical instruments clean of all bio-burden. Your current system is not rinsing all of the instruments in the end with 190-degree water (water hot enough to in effect sterilize the instruments in itself). The Tempest does, workign throughout at 120 degrees and flushing instruments at the end at 190 degrees. Your current system is not spraying your instruments at the end of the cycle with a mixture of ozone and highly-filtered water, ozone being radically more effective at cleaning instruments than water alone. 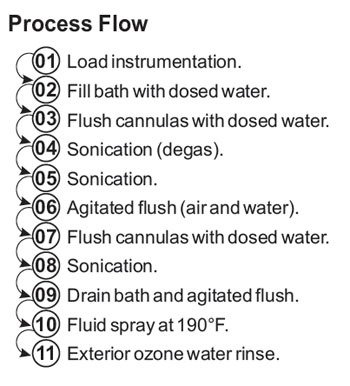 The Tempest does, and this ozonated filtered water puts the perfect finishing touch on what is already the most complete instrument and surgical tool cleaning cycle in the industry. This is the Tempest washer with its hood closed during cleaning. Everything is automated, even down to the raising and lowering of the instrument trays and the lowering of the hood at the start of the cycle. This is what the Tempest looks like with the hood open. Shown here is the Tempest 4000, the larger 4-tray system (a smaller 2-tray system, the Tempest 2000, is also available). The larger Tempest 4000 can accommodate up to 24 laparoscopic devices as well as a wide range of other surgical instruments. Two 26" x 10" baskets are configured for interior flushing of canulated tools, and two 26" x 10" baskets for non-canulated tools. (Even the 56cm bariatic tool will fit in these baskets!) Everything is controlled by the touchscreen display. If you would like to set up a consultation to discuss the instrument cleaning and sterilization protocols you would be able to implement for your hospital with a Tempest in place — and what this would mean in terms of reducing HAI's from surgical site infections, and the consequent reduction of losses your hospital is currently incurring and about to otherwise see rise in 2012 — call us now at 800-839-0722 or fill out our short inquiry form at the top of this page.